I live in Western Australia and I'm having a problem with my horse that I feel you may be able to solve. I've been lurking on the lists for a few months and your post is about the only one that's really made me think "well this guy really may be able to help me." On that note, let's give it a shot. I believe you are about 90% right, they are 90% wrong. Age DOES have something to do with it...it is useless and fruitless to expect a weanling to act like a full grown horse. Up to weaning, a horse takes its direction from its mother, BUT its mother takes its direction from the herd. Using the mother as a conduit, the horse always takes its direction from the herd leader. If a horse is *NOT* taking direction, it *IS* the leader. I believe you have a horse who isn't sure which of you is the leader. You apparently have done enough to where he thinks he *may* be the leader but he isn't sure, so he keeps testing. As he wins more and more tests, he becomes more confident, more challenging and soon, more demanding. But he's nearly 4 years old. He certainly is not a weanling. He simply is not broken. I have a real problem with the word "broke" but while I look for a better one, we'll use it to mean he is not willing to accept what you want. And, I know it almost goes without saying but I always have to head off where this is going...he HAS to accept what you want WITHIN reason. You cannot hurt him, cause him unreasonable concern, or ask unreasonable things of him. You may be able to ride him to the ends of the world, but THIS horse is NOT broken. I define "broke" as that condition that exists when a mother is going about her business and her child, climbs on her, bumps her, orders her around...well you've seen it, and the mother pretty much ignores it. The only thing that gets her attention from her business is either blatant disobedience or "Mom! Mom! ", a direct request for that attention. When you have that kind of relationship with your horse with the horse *acting* like a mother acts, not being a mother or serving as one, but acting like one, you have a "dead broke" horse. Your relationship is turned around. This, as I see it, is the foundation of your problem. Now then, how do we get it flipped back where it should be? We begin in the minds of the parties involved. I understand you have done a lot of ground work and ground work is great. In order to get the maximum from your ground work you have to be mentally prepared for it. I know a lot of the experts say the groundwork prepares the mind. I say, for what it's worth, the groundwork enhances the prepared mind. Groundwork often doesn't work as well as it should. Read my information about round penning a couple of times (Click Here To Email For A Copy). Do it in one sitting of about a half hour, don't beat your brains out over it. Try to understand the sequence and the concepts covered in the explanation. Then, take him back to the pen. Forget everything he (or you) has done, does, or may do. It is a whole new ball game. Mentally tell him, "Put as much distance as you can between you and I and do it now!" Scowl, glare, move at him, cloud up and rain, do whatever it takes to get him to do that. The speed he travels is not an issue, he only needs to keep moving. By this I mean you don't have to get him trotting or cantering, you merely have to get him moving. Ideally, I'd rather the horse moved as slow as possible and still move. If he moves faster than I want him to, I merely move more to the side of the enclosure and claim a blocking wedge for my own so that he has to stop and go back when he comes around to me again. any time he comes into your space without your express permission or with an attitude you do not like, mentally tell him, "THAT IS NOT WHAT I TOLD YOU TO DO!!! GET OUT!! GET GOING!!" and drive him away from you. I say mentally because that's where the thought needs to start. You can voice it if you want, but you won't really need to if you believe it. We want him convinced that, for what ever reason, you are mad enough to kill him if he comes close to you. We do this to put him in a position that is different than what *you* want (showing you respect and listening to your direction) so that we can bring you together on your terms through a clear sequence. He WILL be taken off guard. His first reaction will be to say, "FINE! I'LL LEAVE YOU ALONE THEN! I'LL TAKE MY TOYS AND GO HOME!!" And he'll go around looking everywhere but at you. By that he's saying, "I'm ignoring you...look at me ignoring you...I'm showing you...I'm leaving you behind!" But he's not. You are still too close. He is NOT gaining on you. He cannot get to a safety zone where he will feel comfortable ignoring you completely. In effect, while not even moving, you are chasing him. Now, he has a problem. If he stops, you'll eat him up. The first sign of him coming to that conclusion is when his inside ear locks on you. The outside one continues to move all around, and the inside one may leave you for a moment, but it is validating that you are someone who is, at the very least, an equal to him. Suddenly, you cannot be ignored. About 28 times around a 60' pen is a mile. We don't want to exhaust him, merely control him. I hardly ever let a horse go around more than 6 times in one direction before I change his direction and make him go the other way. I let him move at his own speed for the most part, but he *HAS* to move. The turns are a break that allows him to think, and catch a breath. Sometimes, I pick a short arc on the pen fence and turn him back and forth several times without letting him go all around. I never worry if the horse gets by me, I'll catch him the next time around. Since I have his ear, I want him to figure out how to deal with me. I want to see some mouth movement...lips actually working, teeth showing in a non-aggressive manner, tongue flapping and lip licking, in any combination. At that point he's saying to himself, "I need to do something to get this character on my good side...what can I do??" Sometimes these actions are EXTREMELY obvious. You'd almost have to be asleep to miss them. Sometimes these actions are extremely subtle and you really have to look to see them. Mouth movement is mouth movement. The tongue, for instance, may come out for several inches, or it may just may protrude just enough to make the lips move ever so slightly. 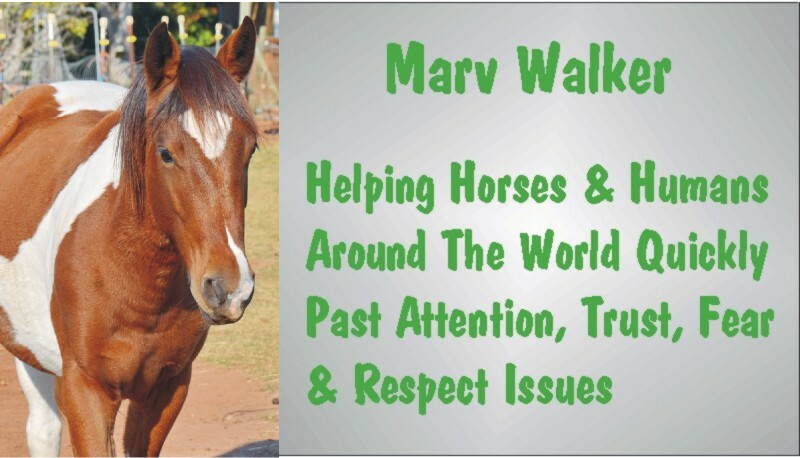 Other signs may be a looseness of the face, a relaxing of the stomach - these and other signs are signals that tension is being released as the horse devotes attention to how it is going to deal with his current situation. He may decide to bluff and just start making the circle smaller, or pin his ears, or kick as he goes around, or snake his head, or just come in, or any combination of these. I then basically repeat the very first direction..."DO WHAT I TOLD YOU! GET AWAY FROM ME!" He then goes back out, usually shaking his head in frustration or some other equine cuss words. Now that he has tried a bluff and it doesn't work, he has to come up with another plan. That's when he's thinking, "This being is acting EXACTLY like that bossy old mare that runs the herd...I wonder if what I use on her will work with this one..." At this point they usually chew some more and lower the head. Lowering means an obvious lowering, any noticeable lowering that is different from where he normally carries his head. Some drop a few inches, some skid their noses on the ground. What they are saying then is, "I'm jus'' a lowly ol' grass eater. I won't cause you any problems. If you'll let me, I'll join you and try to keep you happy...what do you say?" At that point I adopt a mental state of calm & peace and ignore him. That says, "Okay, the matter is settled, then. You may approach me." I do not look at him but I am aware of where he is and what he's doing. I then casually walk by his head, angling across in front of him. And he moves in behind me and we have "joined" to quote Monty Roberts. Sometimes I just turn my back on the horse and give him a few moments to start toward me. If he does not, we do two more laps. Deciding which to do is an experience thing based up the individual horse, but the basic way is to just walk by and pick the horse up. I walk around with the horse following for a few moments then we go to the center of the pen and stand there for a few moments. At that point I do whatever it is I want to do. If he does not allow it or moves away, I tell him, "You lied," by making sure he goes all the way out to the edge and I start him moving away again. After a couple more laps and he usually says, "Let's do it again." I then say, "Okay," and I allow him to come back in again. Depending on the horse it may take several send outs. I suppose that depending on the operator and/or the horse it may even take more than one session. The one thing I keep stressing and I really cannot stress enough is how you simply cannot goof this up *IF* you keep everything low-key for both you and the horse. It is the *ACTIONS* that bring about the change in the horse's attitude not the speed or any time factors. ANYTIME, ANYTIME, ANYTIME, no matter where you are in the sequence, you are uncertain about anything you can stop right there and regroup for an hour, day, week or a month. You can "fail" 100 times in a row and ONE success will override all the previous "failures". Once he stands patiently beside you on his own and allows you to do what you want, he is "broke". Not trained...broke. Because you get into the mind of the horse, it is very quick and very powerful. I've seen staggering changes in unruly horses in mere minutes. Is it permanent? Well, horses are horses and it all depends on the horse. Some horses may need a refresher. But because you know the sequence, as soon as you see the horse MAY be having second thoughts you know how to bring him back in line. *If* additional refreshers are required the time between the needs will greatly increase and the time it takes for the refresher will greatly decrease. 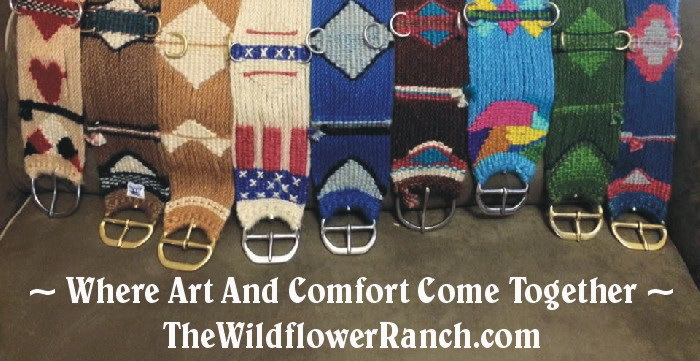 Throw away all of those bits with the exception of a nice gentle round-ringed snaffle. Tack him & bit him in that and go back to the pen. You may want to let him just get used to the bit and maybe even do a little mini-bonder with him to be certain he compliant. When you feel he is ready get on him. If he moves away or shows any unwillingness to allow you to mount (hopefully you are using a mounting block) send him out for a couple laps and then try again. When he allows mounting, get on him and just sit there. If he steps of let him go where he wants on the buckle. You may use the reins just enough to keep him from scrubbing you on the rail if you need to, but other than that, sit there until he settles into a calm resigned movement. Tell him your whole life story, that sometimes works. Then, pick up either rein, imagine it's a spider web...a strong one, but one none the less. Pull the rein until you feel the slightest contact possible then hold it. The second you feel him move into that contact, let it go slack. Do the same with the other. Practice asking him to respect the rein. But alternate your practice, don't develop a pattern the horse can predict. The object here is get him to give to the lightest rein contact. Hold the contact as long as you want him to turn but when he has done what you asked, soften the contact. Right now, we are only concerned with directing the front half of the horse so leave the other rein alone for now. We first want to get the horse turning by respecting the bit, not being overpowered by it...form will come later. Every once in awhile aim him directly at the fence. Just as you think he's going to stop, signal him to stop. Wait a bit then turn him. Your goal is to get him giving to and respecting the bit. Once he does that regularly, and with his new attitude it shouldn't take long. Then you can work on collection, if that is your wish. Use the boundaries of the pen to reinforce your control until you are convinced he doesn't need them. At that point open the pen and wean yourself and him of the pen. The round pen is not a play/riding area. It is a learning center/tool, not a crutch. If you are teaching him anything where maximum control is not an issue, don't do it there. This problem of yours sounds a lot more complicated than it really is. You are very close to getting past it. If he was here with me, I could make some staggering differences in this horse in minutes. You know what? You can too. Just calmly tell yourself, "this is no big thing, and I *will* whip it."